So, last week I go to pick up comics and I have a title I don’t immediately recognize and my inner monologue kicked in “hey, what’s this? oh yea, The End League… do I get this? did I drop this?”. Now, why would I forget that I was getting a title that has so much promise and potential? Hmmmmm… could it be because the last issue came out in November? I don’t know, could be! 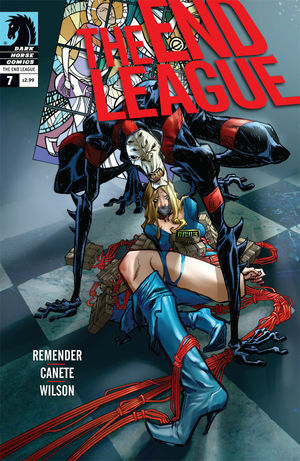 The End League is a worse case scenario superhero comic that describes the fall out of the a “bad guys win” situation. Villains have divvied up the Earth and the good guys are scattered and are being hunted down. I summarize this not necessarily for you, but for me. I started reading issue #7, and couldn’t quite remember the characters or the situation, so I re-read issue #6, and re-read issue #5… and then I just said “scrap it” and read all seven issues. And then I remembered why I thought this had so much potential. Rick Remender does provide a rich story is a detailed. well-thought out holocaust-type world. But it’s perhaps too thought out and details. The End League has an incredibly high story density. So much happens in such a small amount of time and with so much intensity that it’s almost as if the story itself is holding it’s breath and threatening to turn blue. This flat side is only amplifies when you read the series in one sitting. While there is tons of potential in this story and these characters , the double fist of the too-many-situations-with-too-many-details flaw with the lateness of the book (7 issues in 15 months?) and you have nothing more than a missed opportunity from Dark Horse.